1997: Looking Back At TOMORROW NEVER DIES | Warped Factor - Words in the Key of Geek. Matthew Kresal needs collision coverage. Missiles being fired on terrorists. Tensions rising with China. Sensitive technology being targeted by hackers. An American president being blackmailed. A media mogul manipulating events. No I'm not talking about 2017, believe it or not I'm talking about a nearly twenty year old James Bond film called Tomorrow Never Dies, Pierce Brosnan's second outing as Ian Fleming's venerable British spy. It's a film with surprising topicality, something which helps given it is sometimes a by-the-numbers Bond outing. Let's start with the things I just mentioned. For a film that was being made twenty years ago as I write these words, it's surprising how much of it still seems fresh. True, the idea of firing one cruise missile to “take out half the world's terrorists” in the teaser sequence seems laughable now, but much of the plot is relevant to today. Without hopefully sounding terribly political, one only has to look at headlines - the threat of renewed Western tensions with China and issues regarding the hacking of sensitive technology - to see echoes of Tomorrow Never Dies in the here and now. That it then proceeds to make a throwaway reference to the American president being blackmailed by the villain over a potential scandal feels like icing on the cake. In fact, update the technology being used a bit while making mention of the rise of social media and I suspect you could make this film or something close to it today. There's something else that helps that: the villain of Tomorrow Never Dies isn't your typical Bond villain. He isn't the head of SPECTRE or some terrorist, but a media mogul named Elliot Carver played by Jonathan Pryce. Carver is, along with perhaps with drug lord Franz Sanchez from Licence To Kill, perhaps the most realistic of all Bond villains and time has only made Carver more plausible as a character. One can see Carver as an extension of media moguls like Robert Maxwell or Rupert Murdoch, the ties with the later coming across stronger and stronger over time. More than that though, Carver has other ways in which he could have been pulled out of today's headlines. Carver after all is a man who seems warm and friendly in public while in private he can be mean-spirited and prone to outbursts, with more than a hint of being an abusive husband, and at least one moment in the film where the two merge. That Pryce plays the role almost perfectly, finding the right balance between the various elements of the character, ranging from menace to the comedic, makes it all the better. Indeed, if there is anything that helps the film stand up after nearly two decades, it's Pryce as Carver. 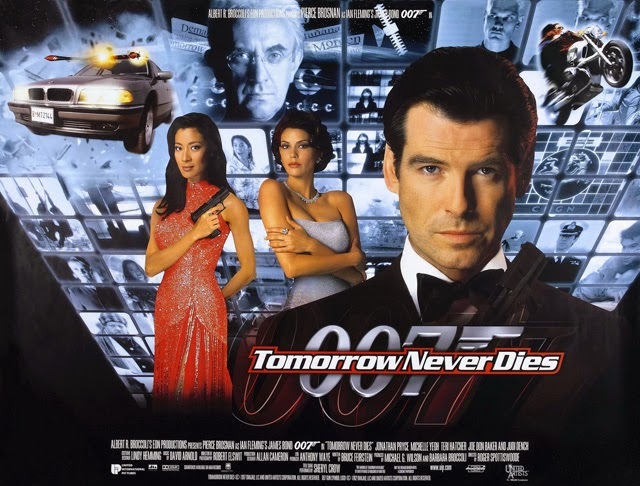 Because looking at it across the years, Tomorrow Never Dies feels like something of a mixed bag. In terms of its plotting, how it gets its characters from point A to point B, it feels very much like a by the numbers Bond outing. There's a sense that we've seen this all before somehow, with the disappearance of a British warship involving a ship owned by the villain and Bond teaming up with a Communist agent to defeat a villain all having been done before two decades earlier in the Roger Moore outing The Spy Who Loved Me. Elsewhere the threat of war (including a potential nuclear exchange) between great powers and the Asian locations bring to mind You Only Live Twice, itself a decade older than the aforementioned Moore film. Then there are the matters of yet another blond henchman who is little more than a set of muscles on legs and not a particularly interesting one at that, and what should be a tough female agent who is promoted as Bond's equal but ends up being rescued by him in the finale. While all this is perhaps something that helps to make the film watchable then and now, the almost generic feeling at times is something that does it no favors when viewed with a more critical eye. Thankfully the perhaps lackluster plotting is salvaged by some good points. There are some solid action sequences including the teaser sequence that builds and builds to a satisfying conclusion and a unique car chase inside a parking garage. The script, for all the issues with the plot, is helped by its central notion of putting a media mogul as the villain as well as both some nice one liners (including a particular favorite delivered to Carver by Bond when threatened with torture: “I'd have thought watching one of your TV shows was torture enough.”) and the occasional nice inversion of established Bond formula. Add onto that a fabulous music score courtesy of composer David Arnold, which finds the right mix between the classic Bond sound of John Barry and more modern electronic elements that is perhaps best highlighted by the aforementioned action sequences. These elements don't make it a great Bond film (though Arnold's score is among the better non-Barry Bond scores), but they help it significantly. Like so many works of “art”, Tomorrow Never Dies is perhaps best described as great ideas let down by their execution. The plotting of the film is generic Bond and it is something that doesn't help it stand out among the ever increasing pack of Bond pictures. Yet it's basic premise, the idea of the media as the villain and a number of other elements make it oddly undated and even topical. How many Bond films can you say that about?